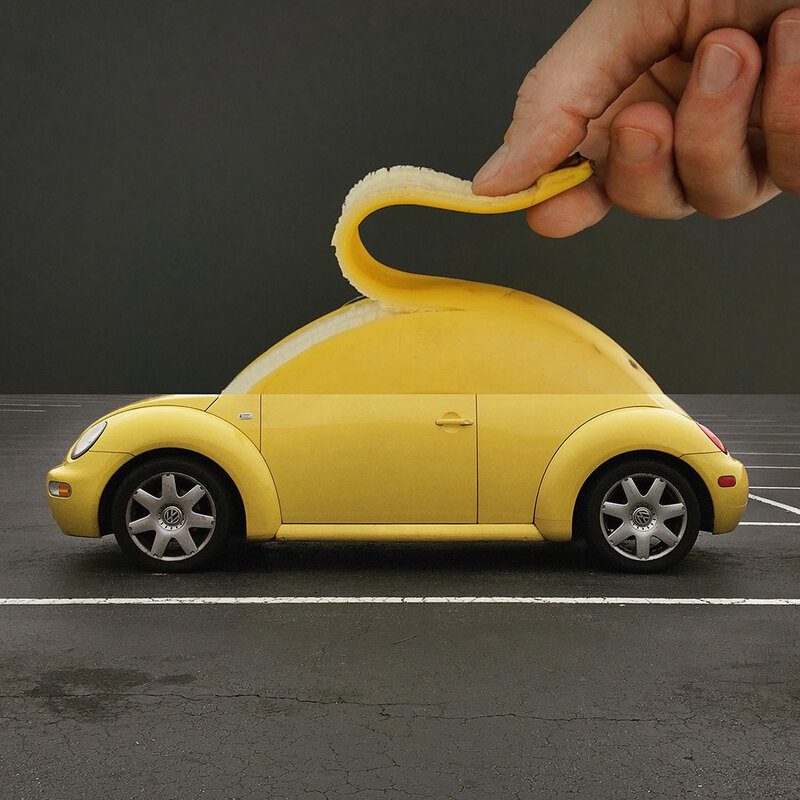 What would happen if you peeled a VW Beetle like a banana? How hard is it to move a two ton meatball? Is it tough to ski on an ice cream cone? Stephen McMennamy gives us the answers to these and so many other questions you'd never think to ask with his project combophotos. Combophotos is exactly what it sounds like: a series of hundreds of photographs taking two completely unrelated objects and combining them. Combophotos started with a major aww moment: McMennamy, fooling around with a photo collage app, combined a picture of his daughter's smile with a balloon from her fourth birthday. He turned the collage into a seamless, cohesive photograph and hasn't looked back. As McMennamy told CNN, "My head's on a swivel. I feel like…I'm always looking for props and objects." McMennamy, a creative director at BBDO Atlanta, has expanded this hobby into a mini empire. His Instagram has 103k followers. Even his outtakes Instagram, combophotofail, where he posts some of the pre-combined photos, combinations that didn't make the grade, and videos of his process, boasts over 3,000 followers. Combophotos has kept the spirit of simple fun that started it all: McMennamy loves to run his photographs by his kids and a friend's kids to make sure that they're whimsical and playful enough. To keep up with Stephen McMennamy's latest combinations, follow him on Tumblr and Instagram.